I was curious about how much the paper covering on the Dollar Tree foam board weighs compared with thin plastic packing tape. I just finished building a FT Edge 540. I removed most of the paper on the external surface and replaced it with thin, bright-colored, packing tape using the same technique outlined in the Experimental Airlines videos. I also removed some of the paper on the internal surfaces, particularly inside the wings. 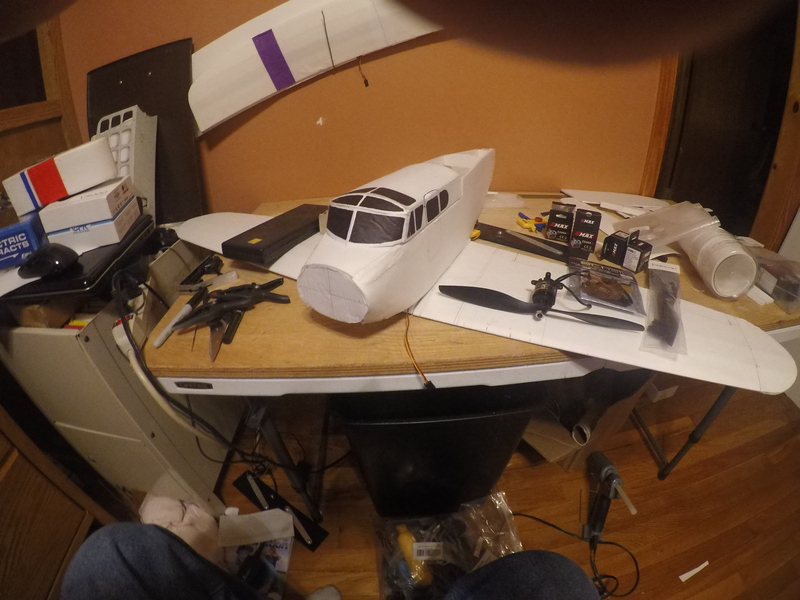 I left paper on most of the internal parts of the fuselage assembly. I removed the paper on the horizontal stabilizer but I left it intact on the elevator. The entire external surface is covered in packing tape, but essentially none of the internal parts are covered in packing tape. I preserved and weighed all the paper I removed from the components which would go into the finished plane and it totaled 90 grams. I wanted to avoid getting overly tedious on an already complicated build process, so I didn’t weight each and every part. I simply weighed the rolls of tape before and after building the airplane. Of course, not all the tape went onto the aircraft. I would say that there was about 20% scrap. It turned out that 87 grams of tape went on the aircraft, according to my estimations. It would be incorrect to say that there is a one-to-one relationship between the paper and tape. Keep in mind that some areas on my Extra 540 have both paper and tape, some have paper only, some have tape only, and some are bare foam. But generally speaking, when it’s all said and done, you could expect any difference in weight between paper and tape to be very close to a wash, at least for the Edge 540. There are other considerations too. I haven’t done any strength testing, but I suspect a wing made with no paper and tape only on the exterior would weight a little less than the standard, all paper version, but it would not be as stiff or as strong. On this aircraft, I replaced the standard wing spar with a carbon fiber tube and a very light 2d printed spar shear web, a technique that I’ve used successfully on previous scratch-built foam board planes. That resulted in a net weight gain but also resulted in a much stiffer and much stronger wing. More importantly, I am convinced that it will produce a wing with greater longevity. The Flite Test construction method doesn’t stand up particularly well to abuse associated with high g maneuvering, rough handling, bad landings, ground loops, bashing your airplane around when transporting it, and even handling during construction. Over time, the foam board gets wrinkles and develops soft spots, so reducing wing bending by using a very stiff spar should extend the life of the airframe. Several of my scratch-built planes seem to confirm this belief when I compare them to my Flite Test Storch kit-built airplane. Someone with a lot of time on their hands could quantify this with more precision, but I feel comfortable in saying that generally speaking you should not expect a huge weight savings by replacing paper with packing tape, at least for planes built from Dollar Tree foam board. The brown, waterproof Flite Test foam board might produce different results. Using packing tape takes more time too; however, in the end you have a reasonably water-proof airframe in bright glossy colors, so I consider it time well spent. This is consistent with my experience. Removing the paper can save weight but replacing the paper with tape leads to negligible weight savings and reduces the strength of the FB. Removing paper is best used for non-structural parts that you want to form smooth curves (e.g. FB only turtlenecks and canopies) or for curved sections that are supported by a sub-structure (e.g. Fuselages). 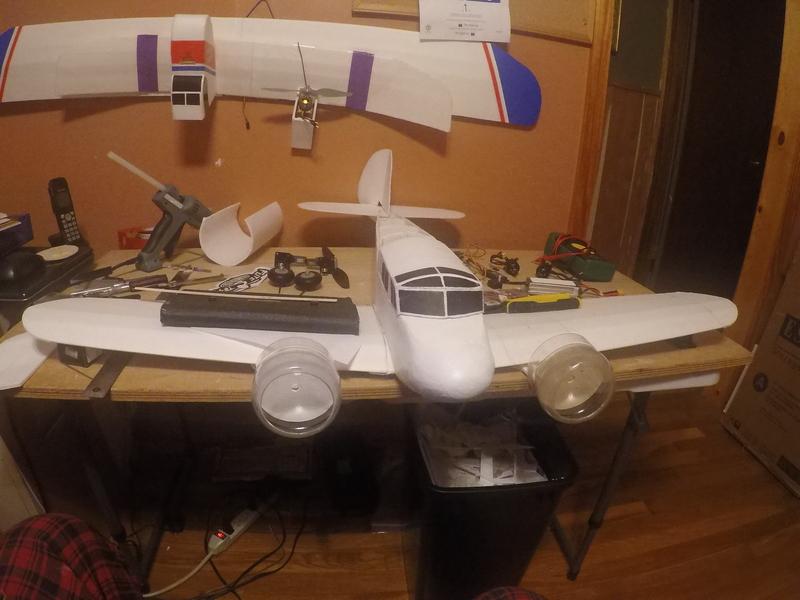 I built a Versa blunt nose and took the paper off the wing inside and out and used tape it did not hold up well. It dented easier and crushed easier, your mileage may vary.